Weld pool geometry is depended majorly on variables like velocity of the moving heat source(v), size (d)and thermal conductivity(Λ) of the material. 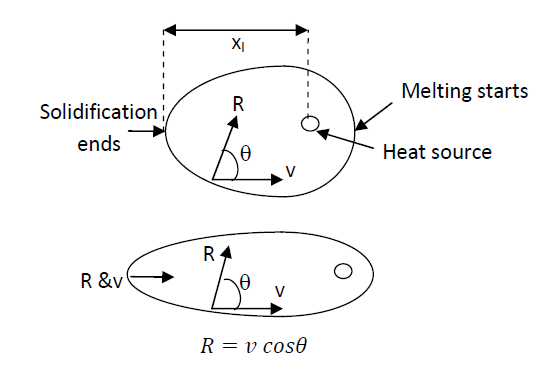 The shape of the molten pool is like a distorted ellipse.The figure below shows the shape of the contour corresponding to the temperature of the liquidus. The front end of the distorted ellipse denotes the location where melting is about to begin. The tail end of this contour denotes the region where solidification is over. The direction of crystal growth is perpendicular to the liquidus. The angle between the direction of growth and the velocity of the weld pool (v) is θ. The rate of crystal growth R is equal to vcosθ . It is the highest at θ = 0. This corresponds to the tail end. R is zero where v is tangent to the distorted ellipse (or the molten pool). This is the point on the moving weld pool beyond which there is no nucleation or crystal growth. Solidification begins from the edge of the solid surface soon after the weld pool moves away from the point where θ was 0 a little earlier. Several nuclei may form but only those that are favorably oriented would grow. Depending on the thermal gradient and the type of the alloy columnar or dendritic growth takes place. The alignment of the grains depends on the velocity, thermal conductivity and the size of the component. A major problem during this stage is the segregation of impurities. During solidification solute atoms are pushed towards the molten metal present along the centerline. This is the region that solidifies at the end. It consists of inclusions and precipitates. The centerline segregation is responsible for the poor toughness of weld joints. Higher the speed higher is the segregation. Tm denotes the melting point of the metal and xl is the distance between the heat source and the tail end of the molten weld pool. The melting point of a filler alloy is known. It is fixed. As v increases xl too would increase. Therefore high velocity of the weld pool means lower thermal gradient or G.
Apart from G & R the concentration of solute too has a pronounced effect on the microstructure that develops in the weld metal. 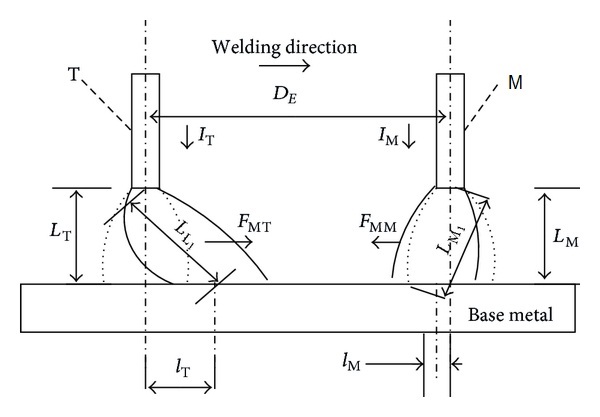 effect of % concentration and G/R on the nature of the structure that develops in the weld metal. If thermal gradient at the solid liquid interface is greater than a critical value the interface is planar. This promotes columnar grains. 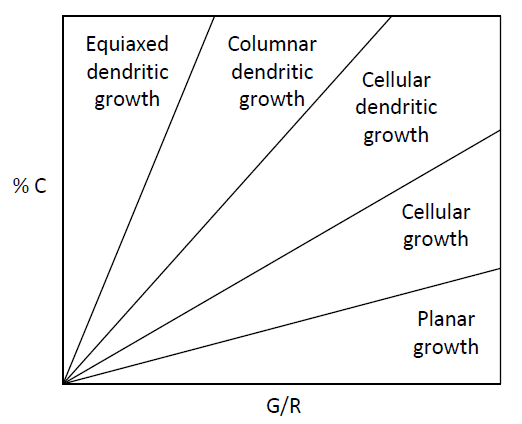 The critical gradient depends on the solute buildup and the corresponding phase diagram. If it is a little lower, the buildup of solute at the interface leads to the formation of a cellular structure. To improve welding productivity twin wire welding has attracted extensive attention. Nowadays, the most frequently used twin wire welding mainly includes twin wire gas metal arc welding, TANDEM twin wire welding, and submerged arc welding (SAW). The primary problem in twin wire welding process is the interference between the two arcs which directly affects the welding quality. The interference between the two arcs induces the variance of respective arc morphology which further leads to the change in thermal space allocation. Here both the wires (M & T-shown in figure) are anode. Therefore, serious interference exists due to the electromagnetic force, which results in mutual offset in arc area. The arc length also changes slightly, which further leads to the arc voltage change. This phenomenon can be simply explained by the deviation formula simplification model (shown below). The above offset expressions demonstrate that the offset of one arc is proportional to the other arc’s current and the square of its own arc length, while being inversely proportional to its own current and the arc distance. Furthermore, the arc shifts due to the electromagnetic force. Due to the effect of arc interaction, twin wire welding droplet transfer frequency increases quickly and the droplet size becomes smaller. At the same time, wire extension length decreases which indicates that the welding point changes. Moreover, due to the heating effect of T arc welding wire, the melting heat increases, which increases the welding wire melting rate. As wire feeding rate keeps unchanged, the droplet size becomes smaller. Thus leading to poor quality of weld bead.